Gallery of emotions or canon of cosmetic make-up. If woman cannot choose physiognomic symbol of this gallery for cosmetic make-up or facial design then it is possible to use hexagrams of the canon of changes i-jing as logic set of conjectural mantic signs for predictive choice of emotional images. The open eyebrows and joyful eyes seem dismal as the mouth expresses sad emotions. The sad mouth and joyful eyes seem frank as eyebrows express open emotions. 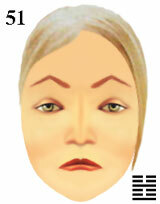 The sad mouth and open eyebrows can seem glad as eyes express joyful emotions. Joyful eyes contradict sad feelings, and ideas of the person realize this discrepancy. Arising desires disturb mind, but actually mournful sensations are the reason of anxiety. logic symbols for canon of cosmetic make-up.